Name: Dinner and a Show! 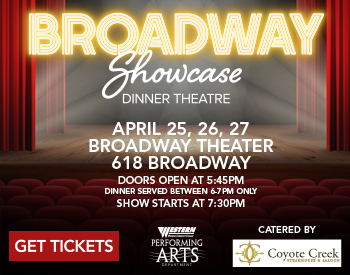 Western Wyoming Community College’s Performing Arts Department presents the Broadway Showcase Dinner Theater. The dinner will be catered by Coyote Creek Steakhouse and Saloon at the Broadway Theater. April 25, 26, 27, doors open at 5:45PM, dinner served between 6-7PM, only. The Show starts at 7:30PM. Tickets for Dinner and a Show are $30 per person (must be purchased by April 18), and tickets for just the show are $10 for adults, $6 for students and seniors. Children under the age of 5 will not be permitted. For tickets or questions, please visit wwcc.tix.com, or call the Performing Arts Office at (307) 382-1721.